To provide a fun and memorable experience for our graduating seniors in a secure environment that is free from drugs and alcohol. To ensure that our graduates are safe on what is one of the most memorable nights of their young lives. 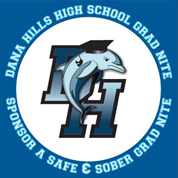 © 1996-2019 Dana Hills High School | All Rights Reserved | All Content Property of DH Grad Nite.